Sunday is October 1st! Can you believe it? 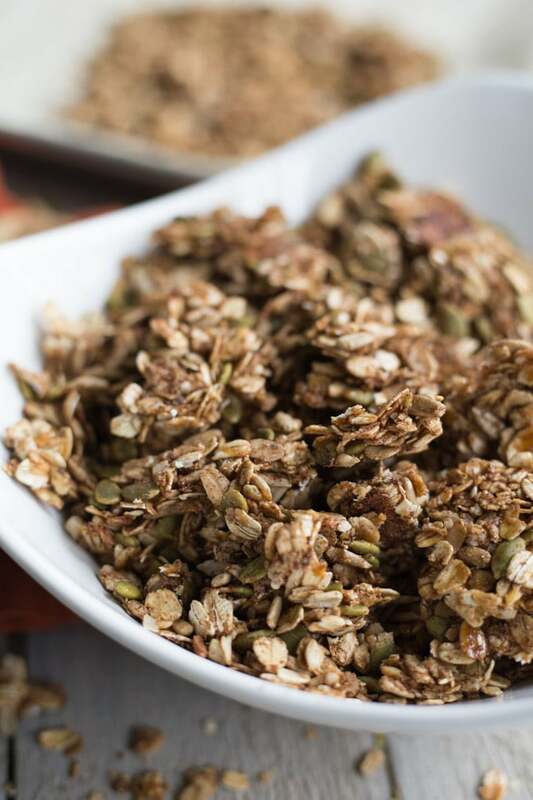 To celebrate the start of my favourite month, I’m sharing this recipe for Nut-Free Pumpkin Pie Granola. AKA, my new favourite pumpkin recipe! 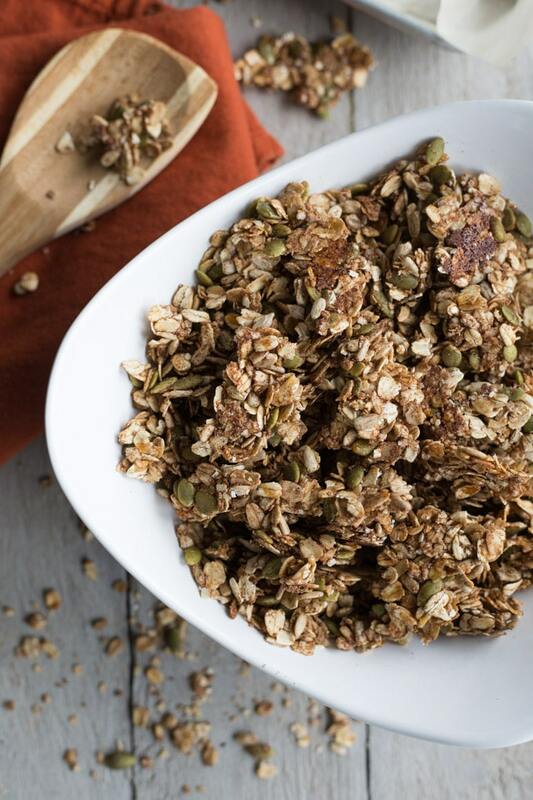 This granola is sweet and salty, crunchy and chunky, and full of fall spices and clean eating goodness! So where did September go? I feel like August just ended and now fall is in full swing! Dare I say that Christmas will be here before we know it! Ok ok, before I get too ahead of myself (which I am totally known to do) lets take a moment and enjoy all things fall. Or in our house, all things pumpkin…..right down to my pumpkin scented candle 😉 . 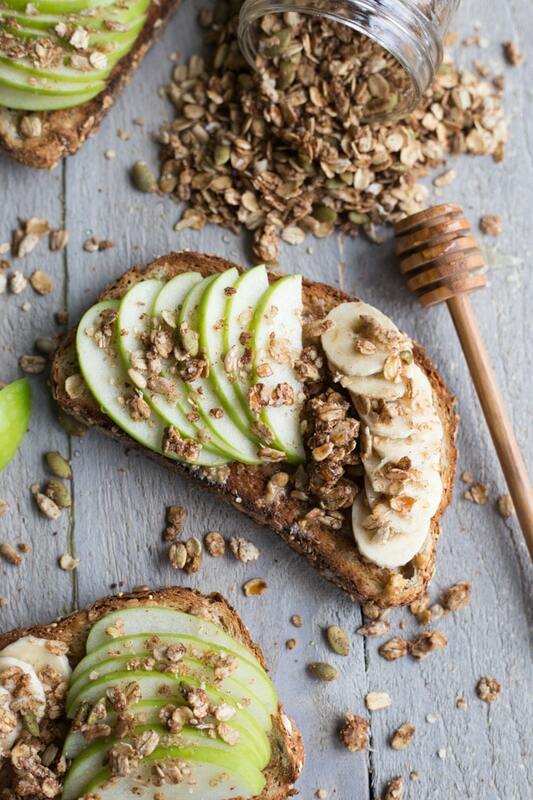 I know I’ve shared a lot of pumpkin recipes lately…..granola bars, donuts, and even pesto. But please be patient if you’re not a pumpkin lover. There will be other delicious fall recipes on the blog next week! In the meantime, you will just have to bear with me while I share this pumpkin pie granola recipe and gush on about how good it is 😉 . I’ve had this recipe on my mind since I visited Minnesota in August. Instead of shopping for clothes, I spent my time at Whole Foods and Target buying food we can’t get in Newfoundland. Seriously, who am I? I was afraid my suitcase was going to be overweight from all the food I was bringing back!! One of the foods I fell in love with while in Minnesota was Purely Elizabeth Pumpkin Cinnamon Ancient Grain Granola. It is delicious and crunchy, and the perfect balance of sweet and salty. 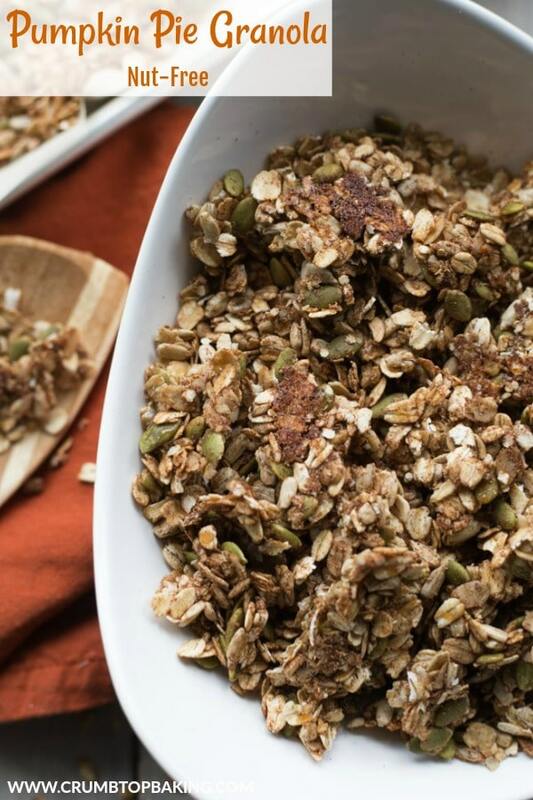 The recipe I’m sharing today for Nut-Free Pumpkin Pie Granola was totally inspired by this granola. 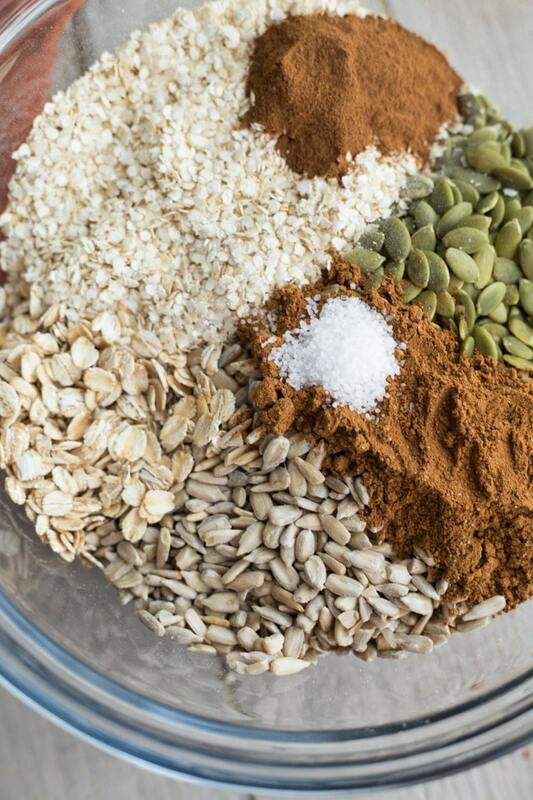 To make it, I just used gluten-free oats, quinoa flakes, pumpkin seeds, sunflower seeds, pumpkin spice, cinnamon, salt, coconut oil and coconut palm syrup. That’s it! In addition to clean eating ingredients, there were two things that were an absolute must when I set out to make this pumpkin pie granola. It had to have a hint of salt and it had to be crunchy and chunky. Finding the right balance of salt in this recipe was surprisingly tricky. I had to make a few batches before getting it right. In the end, it only took 1/2 tsp to give this granola a nice hint of salt. It was also a bit challenging making crunchy granola without nuts. For this recipe, I used coconut oil and coconut palm syrup to help clump the mixture together. And I also pressed the granola into the baking sheet before baking it and didn’t stir it at all until it finished cooling 2 hours later. (That makes this granola pretty low maintenance)! 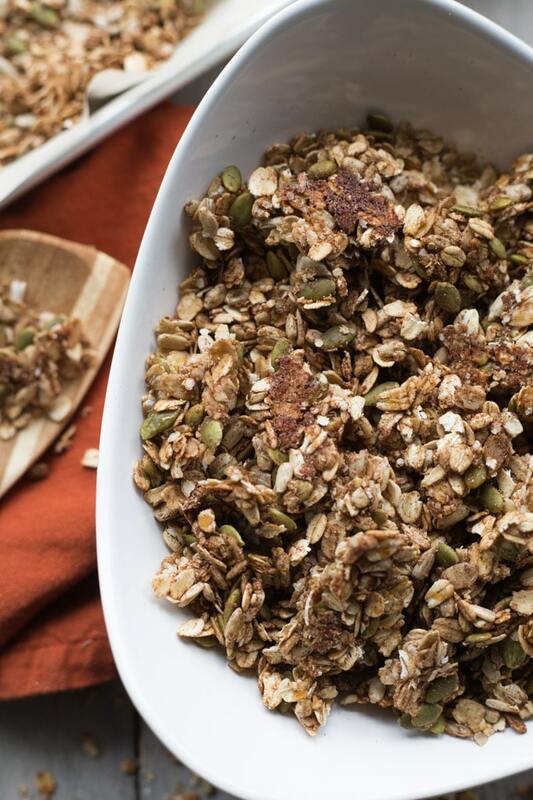 By not stirring the granola, it ends up baking together and then gets crunchy as it cools. Once it’s fully cooled, all you need to do is break it a part to form perfect little granola clusters. If you don’t want chunky granola clusters, you can break it into tiny pieces. I like to do this if I’m using it as a topping, like on top of peanut butter, banana and apple toast (see above 😉 ). But for bowls of granola and almond milk, I like to keep it chunky. And obviously, chunky is better for snacking too! As usual, if you make this recipe, let me know what you think in the comments below. Or take a photo and post it to Instagram. 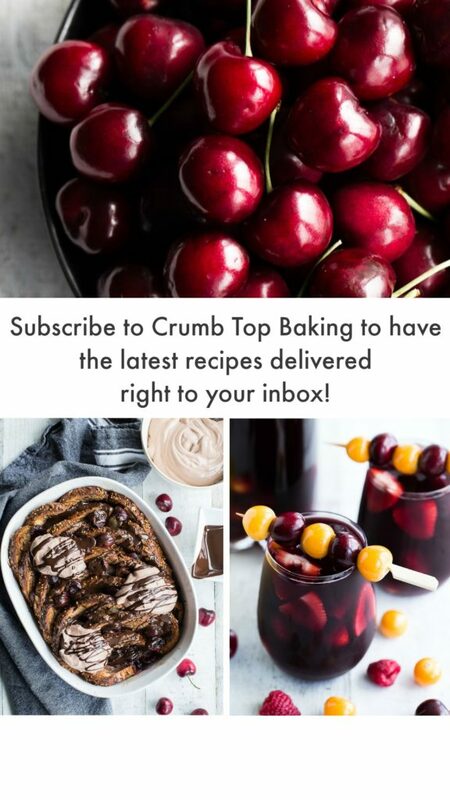 Just tag it @crumbtopbaking so I’ll see it! Nut-Free Pumpkin Pie Granola is sweet and salty, crunchy and chunky, and full of fall spices and clean eating goodness! 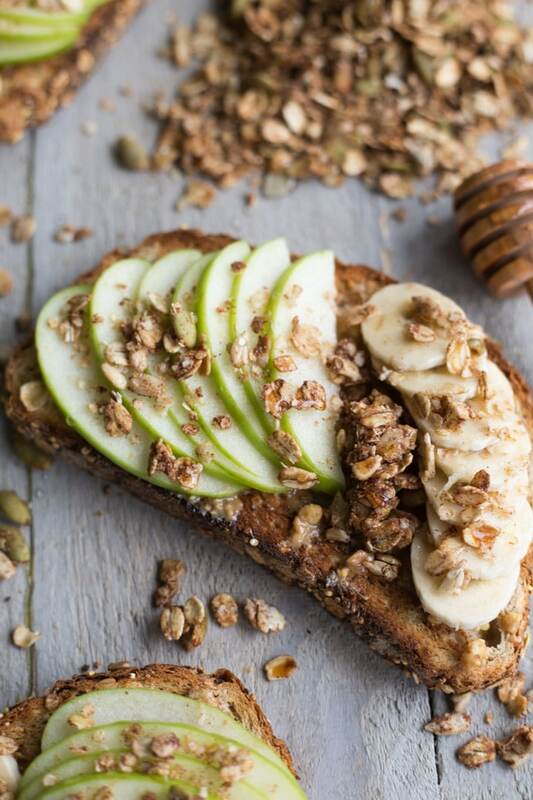 Perfect for a breakfast bowl with fruit and almond milk, or sprinkled on yogurt or peanut butter toast. Pre-heat oven to 350 degrees and line a baking sheet with parchment paper (see note). 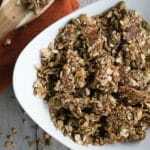 In a large bowl, stir together the oats, quinoa flakes, pumpkin seeds, sunflower seeds, pumpkin spice, cinnamon and salt. Add 2 tbsp of coconut palm syrup and the melted coconut oil to the dry mixture and stir until well combined. Spread the mixture out on the baking sheet and press it into the pan with a spoon. This will help the granola clump together. Drizzle the remaining 1 tbsp of coconut palm syrup over the top of the granola mixture. Place the pan in the oven and bake for 20 minutes. Do not stir the granola while it is baking. Remove from the oven, and let the granola fully cool without stirring it. I usually let it sit for 2 hours. The granola will get crunchy as it cools. For this recipe, I used pre-made pumpkin spice from Bulk Barn, which is made with cloves, cinnamon, nutmeg, allspice and sugar. Since the pumpkin spice contains sugar, you might not classify this granola as strictly clean eating. While it’s only a very small amount, if you prefer, you can make your own pumpkin spice. I typically use The Pioneer Woman recipe, which doesn’t contain sugar. It also includes ginger. Just note that a different pumpkin spice recipe may change the flavour of the granola slightly. To prevent the bottom of the granola from burning, I recommend using a lighter stainless steel or aluminum pan. The granola will brown quicker on darker pans and may burn on the bottom.